While the statement was directed at the mortgage business in general, it especially rings true in the reverse mortgage business. When the financial markets started falling apart in 2008, investors for jumbo reverse mortgage products disappeared. In response to the lack of private capital in the marketplace, the federal government stepped in to fill the need and raised the national HECM loan limit to $417,000 and then $625,500 months later. With a higher loan limit, the HECM program provided borrowers with more proceeds and no one saw a need for proprietary products anymore. All that changed in October of last year when the principal limits were lowered by 10% due to the Office of Management and Budget saying the program needed a $798 million subsidy to break even. Since the cuts were made origination volume continues to trend lower and has yet to recover. Facing the possibility of another principal limit reduction for FY 2011, many believe the need for proprietary reverse mortgages is back. However, the impact the private markets is limited because the HECM provides so much money to borrowers. 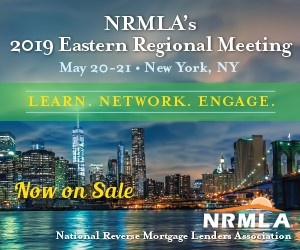 “At the end of the day its about the cost of money and we’re so far away from what the private market will ever be able to provide,” said Jeff Lewis, Chairman of Generation Mortgage during a NRMLA conference in Philadelphia earlier this year. His company released the first private product in two years earlier this week, catering to borrowers with higher home values. “If a home isn’t in excess of 1mm, I can’t see our program working for the borrower,” Lewis said in an email to RMD. Others believe that if the government would lower the loan limit back to $417,000, the private market would come back in a bigger way. “As long as the loan limits stay so high, it will be hard for the jumbo to compete,” said Joe Kelly, Partner at New View Advisors during the MBA’s secondary market session. With the current loan limits set to “sunset” back at the end of the year, Congress would need to vote to extend loan limits at $625,000. There has been talk about keeping them the same, bringing it back to $417K, and even some rumors of $550,000. Where they will end up is anyone’s guess, but is now the right time to lower the loan limit?